Do you have a SOLID gameplan for 2019? Are you ready for your brand or business to Level Up? Look no further! The 2019 WomanUp weekend has been designed exclusively for you! Saturday hosts our annual LevelUp conference which is always broken down into two segments. Seminar and Panel. Our seminar topics this year focus on business credit, marketing & branding, health & wellness, and entrepreneurship. Business and Credit Coach, Tareka Coney, will effectively teach you the ins and out of business credit through her Credit is Power workshop. Her client success rate is 100%! Aren't you ready to take full advantage of business credit? Learn from the BEST! One of Central Florida's top marketing & branding mavens, Aisha Ayana, will host our marketing and branding seminar educating everyone on how to become a marketing and branding guru. You will learn how to market on social media effectively, increase social media influence, steps to create brand identity, and how to DOMINATE your industry. Being able to live a fulfilling life is so important, that why we're so excited to have Health & Wellness Coach, Dr. Neshia MClendon, to spearhead our health & wellness seminar to ensure we have the tools we need to live our best life! 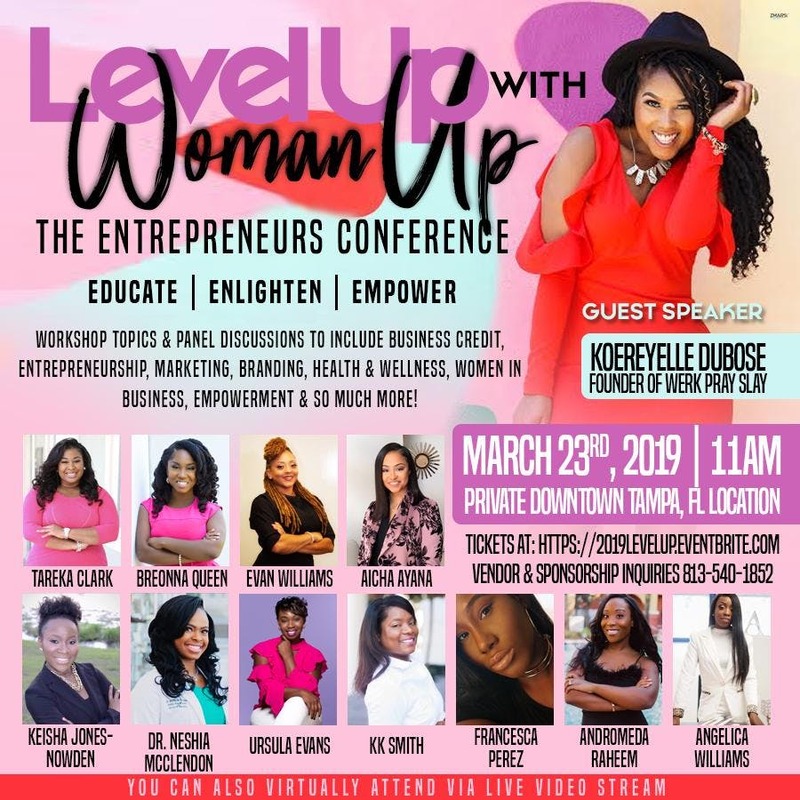 Our guest speaker this year is Koereyelle Dubose and she's dropping some major entrepreneurship gems! Learn how she successfully turned her 32k teaching salary into a 6 figure brand! This year's conference panels will be moderated by Tampa Bay's very own News Channel 10 anchor, Aubrey Jackson. Our panels will consist of several industry leaders including Evan Christina, Andromeda Raheem, Angelica Williams, Ursula Evans, Francesca Perez, KK Smith, Breonna Queen, Keisha Jones, and a few others guests! These ladies will be discussing some amazing topics including sisterhood, empowerment, balance in business, media marketing, and tons of other topics but wait,,, there's more!